Annandale Estates is an experience, not just a place to call "home." Imagine living where the present embraces the past. Imagine living where the pristine beauty of nature and the refined elegance of architecture exist in harmony. Imagine Annandale Estates. 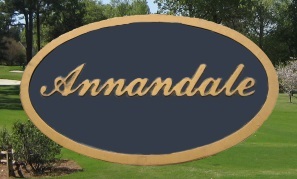 Nestled in the quiet woods of Madison County, Annandale's prestigious gated entrance welcomes both visitors and residents to an all-inclusive community where nature is part of the lifestyle. A great place to live and play. Relax. Enjoy. Walk. Explore. Serene lakes border the green rolling hills of two private golf courses, while azaleas, magnolias, and dogwoods exude a Southern flair to neighborhood landscapes. Ducks and geese can often be seen in flight or navigating the waters. In the evenings, when the red and orange hues of the sunset sink beneath the towering pines and hardwoods, it is easy to understand why Annandale Estates is our home. The Annandale Property Owners Association is professionally managed by . Association homeowners can access a variety of useful information, resources, and tools to help connect association families and keep them up-to-date.